I'm waiting for "Rancho Deluxe" from Netflix now, but I sure remember the 'Cattle Queen'...it still shows up once in awhile. "Big Sky" remains my favorite film...and seeing the Mandan replica in Fort Benton is a particular treat. Read just today that it is sadly in need of repair. Another project for the wee town. I really love "Rancho Deluxe," but I suspect it's not to everyone's taste. 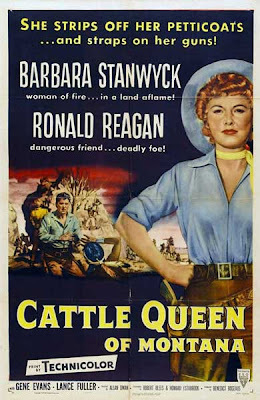 "Cattle Queen" honestly doesn't do that much for me, but I haven't seen "Big Sky" in years ... I'll need to add it to my Netflix queue. So many good Montana movies. And Fort Benton has so much cool stuff to see! Definitely my very favorite town in that part of the state ... I really need to do a couple of posts about it here. Re: "Rancho Deluxe" I got a 'short wait' notice from Netflix...the film must be lost in their archives somewhere...grrr. I only saw it once years ago, so if it ever surfaces again it will be like new viewing again. As for Fort Benton...I rather hope it's kept a secret...at least while there's a glimmer of hope I could move there...LOL. Then again I obsess about the town...so am at sixes to discuss it much...but it's truly a jewel. I met Muncie of 'View From the Bridge' at the research center...she told me about their little writer's group...made me drool, and I'm NOT a joiner. Yep, I'm definitely not a Hi-LIne person (lived in Havre for a little while, and really disliked it) ... but Fort Benton is an exception. I really love that place. It needs to be "discovered" just enough to keep it going ... but not enough that it gets filled with California-built trophy homes! That's happened to too much of the state already.